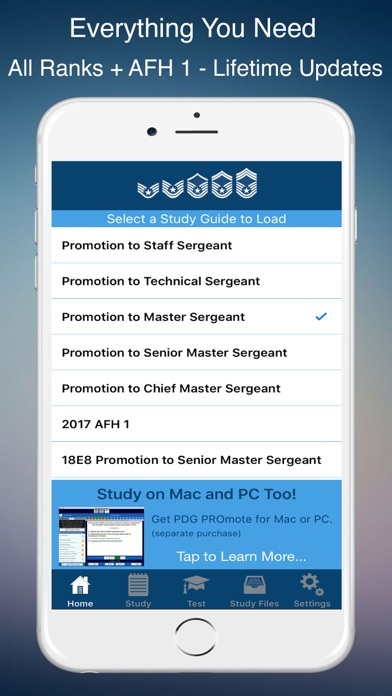 Why should you join the countless Airmen who have already been promoted using this app? Read on… 1. PURCHASE ONCE, USE FOR A CAREER! PDG PROmote provides lifetime free updates. 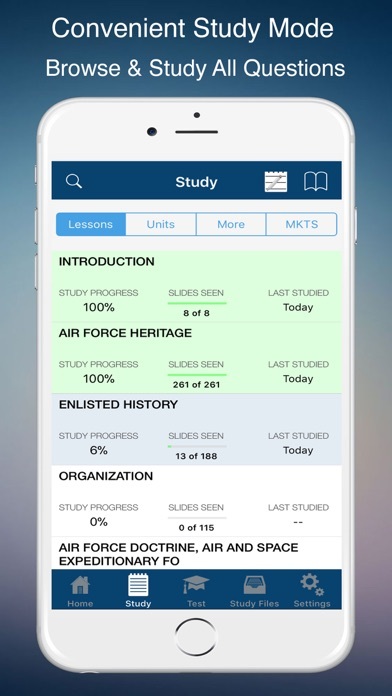 Why should you have to pay for a new app every time the study guides are updated? You don’t pay $0.99 for these apps. You deserve lifetime updates. We know that your promotion is important to you but that doesn’t give us the right to take advantage of it. We ask for a fair price and in exchange we give you a great app that you can use for your entire career. It’s the right thing to do. 2. OUR QUESTIONS ARE SIMPLY BETTER. Many of our users have commented to us that our questions aren't as simplistic as other apps. They make you think a little more. The actual exam seemed easier. PDG PROmote provides TOTAL COVERAGE of the AFH 1 based study guides with up to 4,800+ truly unique questions depending on the study guide. What do we mean by truly unique? We don’t count questions multiple times just because they might be asked in a different format or slightly altered. 3. OPTIMIZE YOUR LIMITED STUDY TIME. You have a full-time job. We know you need to get the most out of your limited study opportunities. PDG PROmote makes it easy for you to maximize the effectiveness of your study sessions. 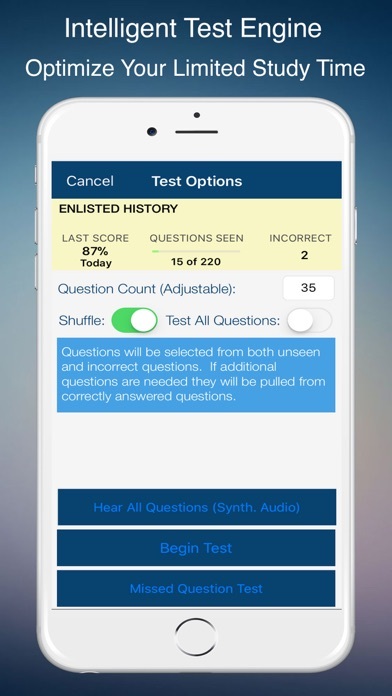 Our Intelligent Test Engine automatically prioritizes the questions you need to study. You can further maximize your efficiency by choosing to study or test by MKTS. 4. BEING SKILLED IS WHAT MATTERS. We originally launched PDG PROmote in 2011. We are proud of the fact that it became the #1 selling PDG / AFH 1 study guide app after only 4 years. Our ability to extract important information and formulate great questions is second to none. Our success comes from our ingenuity, our competence, our processes, our work ethic, and our attention to detail. If we needed years and years of experience to master a document that you are being asked to master in mere months you probably wouldn’t want to use our app. 5. INTUITIVE DESIGN. PDG PROmote is simply the most intuitive and least frustrating AFH 1 study guide you will find. Experience the difference a great designed app can make. 6. AUDIO QUESTIONS. Yes, we use synthetic audio and not a real human voice but we include it in the app for free. It’s a popular feature that many of our users use on their drive to and from work. 7. STUDY FILES. PDG PROmote allows you to store any other documents or audio files you use to study within the app for convenient and centralized access. 8. DON’T BE TRICKED INTO PAYING SKY HIGH PRICES! You will be accused of selling yourself short. Don’t believe it. You will be asked to pay a small fortune for their "experience". Just remind yourself that you are being tested on a handbook (AFH 1) dated 1 October 2017, not 1987. 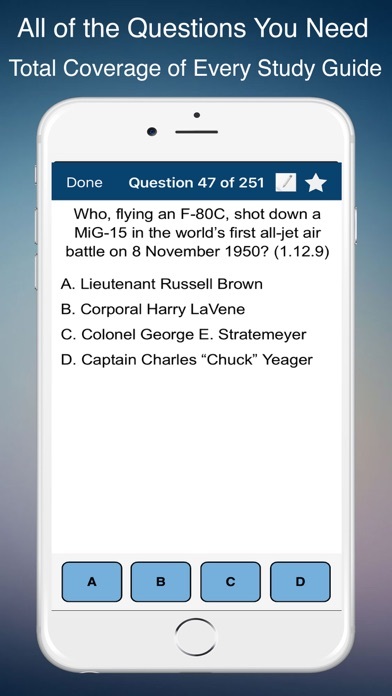 You can easily find Airmen who have used our app and scored high. THEY ARE EVERYWHERE. Our users pay two or even three times less, get the same or better results, and get free lifetime updates. Doesn't that sound wise to you? NOW ON MAC AND PC! Go to http://forcereadiness.com/pdg-promote-pdg-study-guide to learn more. 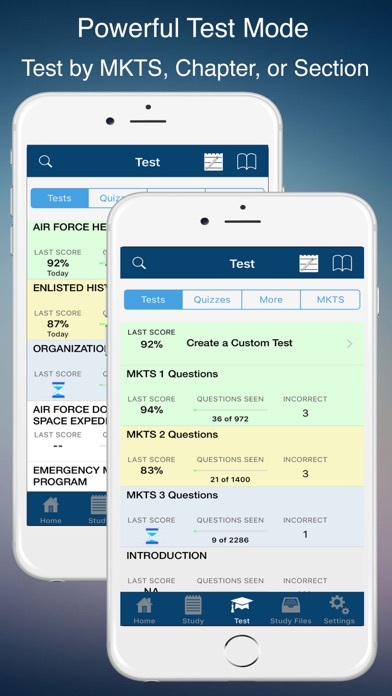 PDG PROmote is an application aimed to prepare Airmen who are taking the Air Force Promotion Fitness Examination (PFE) or the USAFSE-United States Air Force supervisory examination. Its sole source of reference is The Study Guide for Promotion to (SSgt, TSgt, MSgt, SMSgt, and CMSgt), 1 October 2017. All study guides are sourced from Air Force Handbook 1 (AFH 1) dated 1 October 2017. Just select the appropriate study guide for the promotion grade that you are testing to and begin studying! Makes it easy to study. Maybe you could add some simple jeopardy style or matching games with sound effects for those of us who find it hard to study by flash cards and quizzes. App still works great but if you’re still looking to improve and stimulate the mind, these are things other apps have done. This is my first time actually attempting to study. I will update the review after I receive my scores. I have approximately a month and a half till I test and will likely only receive a promote. Hopefully I can come back and write a decent review after the scores are released. I have used this for the last 3 years and would continue to use it if E-7 testing wasn’t being retired. I recommend this app to all my troops, very well done. I’ve been using this app to study for promotion for the last 8 weeks and it definitely makes me feel more prepared for the WAPS this cycle. Even though some of the hints for remembering things seem super random, they definitely help you remember the material. Good job with the functionality and easy to navigate interface. I also like the MKTS option to study topics of more importance. Excellent app and I have already recommended to my colleagues at work. Keep it up! Best app around one big flaw! This app is a great tool to promote even if you have limited time. However right now the only way to test on more than one chapter is by Custom Test>select chapters and # of questions. The problem with that is that some of this chapters are fairly big and riddled with A3 sections and the test will try to pick an even amount of questions from each chapter. (Most chapters have more A3 material than any other material). Technically there is nothing wrong with that as it will still be testable information. But even the app recommends X1 (x being the leve of understanding; abc) the most and X3 the least. So you will spend most of your time on “less important material”. If only there was a “Mock Wasp Test Option” where it selected from all the elegible chapters but in a rate that most of the material was extremely important; followed by Very important; and last the Important material. This option would make an already great app the best all around app. Adding a timer to said option would be the cherry on top. The app is good with some glitches that can be easily resolved, example unable to continue or return from where you left. The major issue is the line of question needs to be updated. MKTS priorities list is good but the questions were never revised. Example E7 MKTS Airman’s Creed questions should not be the same for E8. This app lays out the material very well !! Overall the app is great, formulates great tests but I feel that there should be links the the PDG for questions so that you can read the source yourself. Yes I know you can go look it up yourself but a quick link in the app would make it a nice one stop shop so to speak. I would recommend this to a friend btw. Buy it. Well worth the money and very convenient to have on your phone. Make sure to sort your study chapters by MKTS.